This is the "White" edition of Bank in the Form of a Pig. Looking for a great gift idea for yourself or your loved ones? Bank in the Form of a Pig will hog your change! 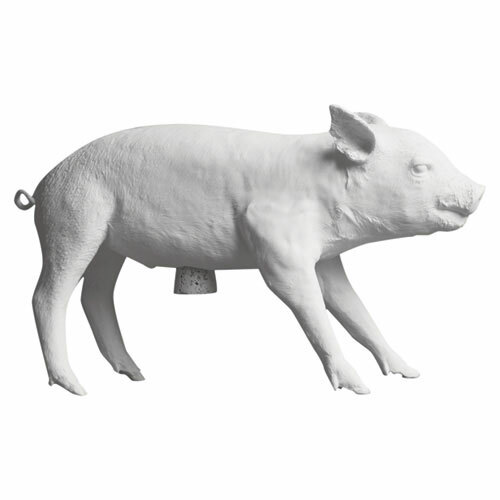 The Bank in the Form of a Pig was designed by Harry Allen for Areaware. Bank in the Form of a Pig is a pretty large piggy bank; it measures 18 inches in length and stands 10 inches tall. This wonderful piggy bank holds up to $10,000 in dollar bills. This piggy bank is that big! It is a very decorative design object which will certainly compliment your home decor. This very unique piggy bank is a great alternative to the more common money banks, it makes a great unique gift. Bank in the Form of a Pig was cast after a real little piggy so it resembles the real deal down to the finest detail. The Harry Allen Pig Bank is made with cast resin marble and a cork stopper.